.. is the ONLY way to succeed in life. You have a choice everyday as to whether you will allow yourself to get tripped up on the stumbling blocks OR whether you will use them as stepping stones to a new and better future. As human beings, it’s common behavior to let the stumbling blocks in our lives take us down and destroy us. We get caught up in the drama of the stumbling block and forget that it is our responsibility to get back up and make our lives better because of what we have experienced. We sit there for months/years blaming the stumbling block for throwing us off course. And what does that do for us? How does that help us or make things better for us? It doesn’t. No stumbling block is in place to make a mess of your life, it is only in place to help you become stronger, more sound and more stable in yourself. Stumbling blocks can also be in place to alter your direction in life when it’s time to go down a new road. 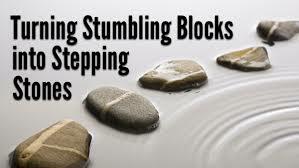 Regardless, stumbling blocks are ALWAYS the impetus for great change and success. They should never be viewed as obstacles along our path. Once we learn how to turn those stumbling blocks into stepping stones, we realize that we can now rise higher then we ever thought possible. Time to start stumbling!